"Bluegrass Reel" - an all too rare recording of one of Britain's most exciting bands of the 1980's. The eight tracks on this cd are all written by the band. R osie Davis's four vocals include her driving version of "Forgive and Forget". Rick Townend's banjo picking is featured on his own composition "Casablanca" and he plays a wistful dobro on fiddler Bob Winquist's "White Star Waltz". 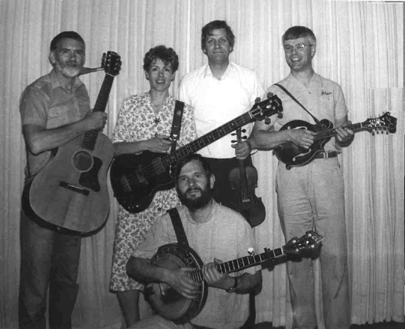 These days Bob can be seen with "A Band like Alice" for whom Alan Ward plays mandolin. Alan displays his precise technique on the title track, his self-penned "Bluegrass Reel". Guitarist Rod Davis sings "Southbound Flyer", a product of his own felt-tip. Click here to pay in UK£. EUROS or US DOLLARS via the PAYPAL SECURE PAYMENT SYSTEM which accepts all major credit cards. Click here to email Scorpion Publications.